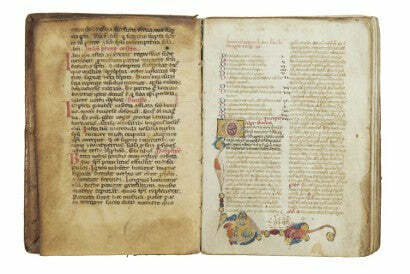 A remarkable 14th century Franciscan text from Italy has sold with excellent results in Bonhams' auction of Early Printing and English Books, which was held on October 2 in London. The 700 year old work is a combination of two Franciscan texts in an early Italian blind-stamped binding. Entitled Gregory I, Saint and Pope, the first book features The Dialogues of St Gregory, which include stories of Italy's great saints, holy men and woman. The second solely features an "exhaustive" biography of Saint Francis of Assisi, created by the scholastic theologian Bonaventura. Both texts would have been regularly read to the friars during their day and were created hundreds of years apart. To find both works in the same codex suggests that the remarkable work was made for a Franciscan convent, with added paragraphs informing us that the manuscript was once part of a Franciscan library, probably at the convent, during the 15th century. The text boasts magnificent illuminations, which were designed both as decoration for the work and to link together the two texts. The colours and style of these illuminations suggest that they were created at a workshop in the Bologna area, which was known as the centre of the Franciscan movement. Against an estimate of £20,000-30,000 ($32,250-48,250), the work achieved a final realisation of £49,250 ($79,426), up 64.1% on its initial valuation. Paul Fraser Collectibles has a fantastic selection of ancient manuscripts available, including an Elizabeth I signed document with the Royal Great Seal. For more of the latest news and investment advice, sign up to our free weekly newsletter.